It’s starting to sink in: people are beginning to realize that with Postmatic the last piece of the WordPress email puzzle has been put in place. 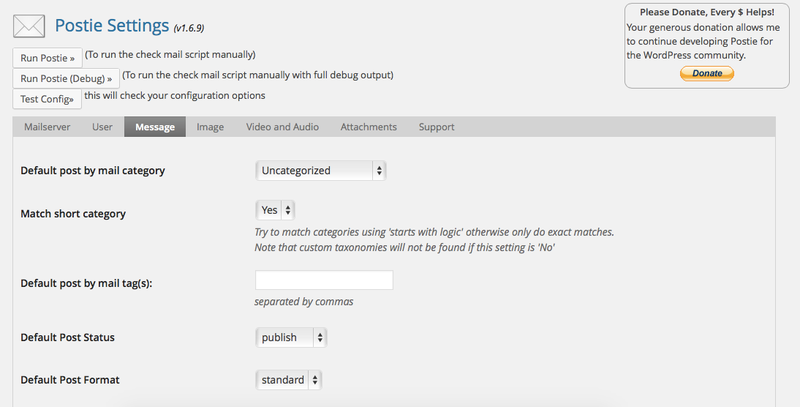 It’s now possible to write and manage a WordPress blog without ever leaving your inbox. Goodness. You can send new posts in, get comment notifications out, and reply to them in turn. Happy days. In order to set up a 100% email-based WordPress blog you only need two plugins. One for publishing new posts via email, and Postmatic for sending posts out and managing email-based commenting. Getting posts into WordPress via email: And how cool is Postie? I have been a fan of publish-by-email plugins for a very long time. I think the concept is wonderful: publish a new blog post simply by writing an email. This is a very good thing for people that aren’t comfortable with the wp-admin interface and lucky for us all there are a handful of plugins that let you do this with varying degrees of complexity. My all time favorite and the steady workhorse in this area is Postie. Postie is a bit of a legend in my mind. Maybe it is for other WordPress developers as well. It’s just always been there and always been moving forward. I remember using Postie on one of my very first client sites somewhere around 2006. That’s about nine years ago. What is remarkable is that since it’s first release in 2004 it has been through no less than 4 lead developers and dozens of contributors (yours truly included). It’s a model open-source project. Postie lets you write an email to a top-secret address (which you define) and pulls down email from that account at a set interval. It will then publish the post, or set it as pending, whatever you need. It even supports custom post types, formats, turning attached images into galleries, categorization, the list goes on forever. Some of Postie’s awesome options for publishing posts by email. Once you have Postie installed and configured you are all set up to send in new posts directly via email. The subject line becomes the post title, the body becomes the content, and any attached images become the featured image and galleries. You can share the secret address with anyone and as long as they send mail to it from the address which is associated with their WordPress account the post will publish as if it were by them. As soon as your post arrives and is published by Postie it will be sent out to your subscriber list via Postmatic. Postmatic will keep all of you galleries and images intact, and even make embedded content look great. Users the world over will receive your content on their PCs, tablets, and phones. How galleries render in Postmatic. 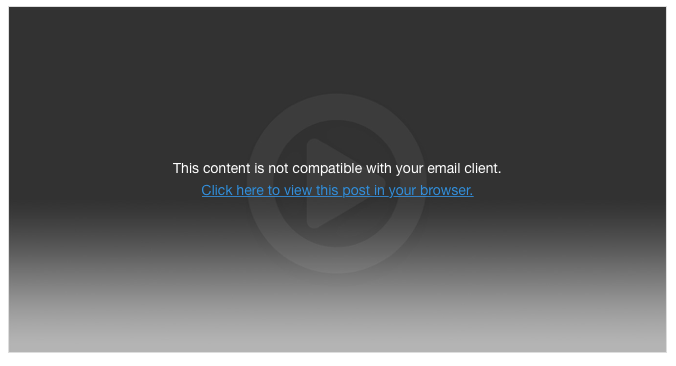 Embeds are handled gracefully while recognizing you can’t play videos from email. When your subscribers receive your post via email they will be invited to reply to leave a comment. If you have subscribe authors to post comments enabled in Postmatic settings then you will receive a copy of each comment as they are delivered to your inbox. How to subscribe authors to all comments in Postmatic. 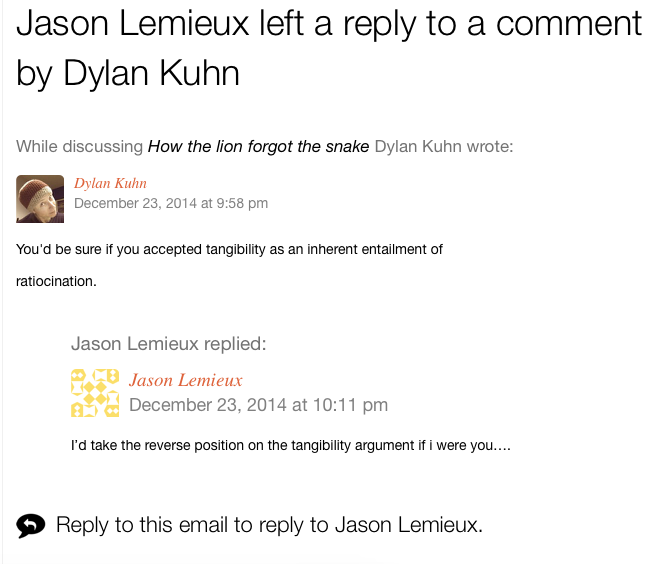 You’ll be able to reply to the comment via email, and your comment will be sent to the commenter. They can reply as well. On and on…The entire conversation happens via email. A new comment notification in Postmatic. The notices show not only the new comment but also a history of the conversation… ending with a prompt to add your own comment. 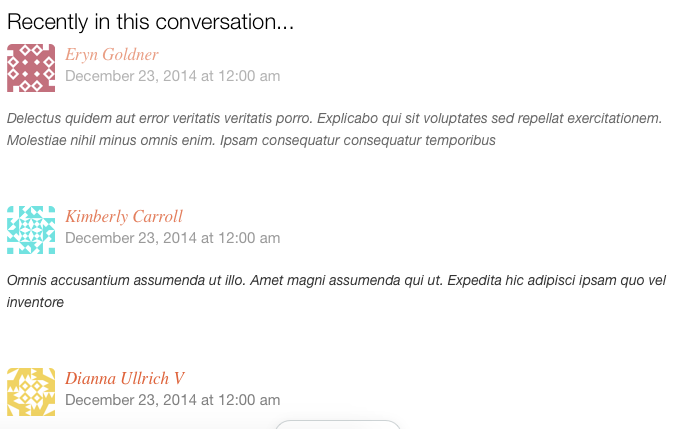 Threaded comment notifications show the context of where a comment happened within the larger conversation. This is where it gets interesting. With these tools, why limit yourself to blogging? What about community sites? Out of the box WordPress, Postie, and Postmatic offer up some pretty intriguing possibilities for building list serves, help sites, or community forums. All with both web and email interfaces. More on that in part two of this post.